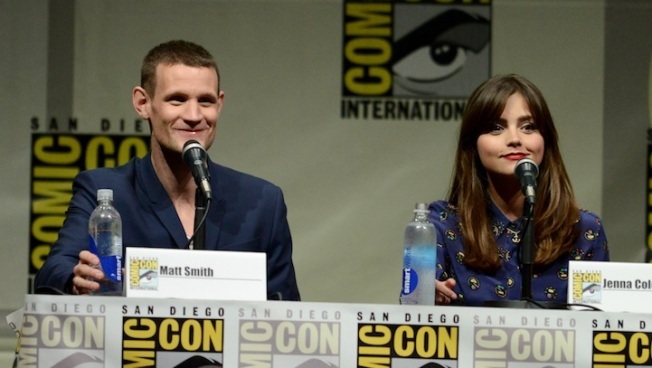 Matt Smith, left, and Jenna Coleman participate in the "Doctor Who" 50th Anniversary panel of Comic-Con International on Sunday, July 21, 2013, in San Diego. For the past 50 years, it's a question any British or British Commonwealth denizen could answer without pause. He's an alien traveler in time and space with a particular fondness for the inhabitants of planet Earth. He travels in a tall blue box called the Tardis (which is bigger on the inside than out), he has two hearts and the ability to regenerate his body when his current physical form dies. Previous to a 2005 reboot (the BBC-produced show first aired in 1963 and ran until 1989 before being shelved), "Doctor Who" was little known to those of us this side of the Atlantic. A walk around the floor of the San Diego Convention Center on Sunday, the final day of Comic-Con International, offered proof that the Doctor (in all his guises - the character has been interpreted on the series by 10 different actors to date) is now a white-hot property in America. Countless enthusiasts dressed as their favorite incarnation of the character crowded the aisles and thoroughfares checking out "Who" merchandise ranging from Tardis-shaped cookie jars to bobble-head Doctors of every variation. So popular is the franchise right now that fans had been camping out on-line since the previous day for the chance to see Matt Smith, the actor currently portraying the Doctor, and his co-star Jenna Coleman who plays Clara, the Doctor's traveling companion, at BBC America's 50th anniversary of "Doctor Who" panel. Ashley McGuire - wearing a dress fashioned to resemble the Tardis - and her two children had been waiting since 6.30 a.m. "The line was already out by the Bay by then," McGrath said of their arrival time and the length of the queue that stretched to the other side of the convention hall. The panel was scheduled to commence at 12.30 p.m.
A fan since the 2005 reboot, McGuire said it was worth the wait because they are all "really, really big fans." Her hopes for the panel included a peek at what's planned for the 50th anniversary special episode which features not one but two Doctors - both Smith and his predecessor, actor David Tennant. Also wearing a Tardis-inspired dress was Lissa McGrath, whose excitement was building as she approached the entrance to Hall H - the biggest of Comic-Con's locales with the capacity to hold more than 6,000 people and the venue for the "Doctor Who" love-fest. For McGrath, who had attended all four days of the convention with her 7-year-old daughter Rowan, "Doctor Who" holds a special place in her fandom hierarchy. While she currently resides in San Diego, McGrath was born and raised in Harrogate, a town in North Yorkshire in England. "I've been a fan since I was Rowan's age, about 7," McGrath explained. "I grew up with 'Doctor Who' being a Brit." Though her first Doctor came in the guise of actor Sylvester McCoy (1987-89), it's Tennant's interpretation that remains her favorite. The tenth actor to play the character, Tennant featured in the series from 2005 to 2010. "He really took the 'Doctor Who' phenomenon that I knew as a child to a whole new level," McGrath said. Her hopes for the panel? "I was here last year and it was really nice to see some of the upcoming season, and it's nice always to see the actors. Seeing Jenna for the first time will be just amazing. Of course we are hoping for David Tennant because it is the 50th anniversary. That's the thing that is so wonderful about these panels is that you never know who or what you are going to see." McGuire, McGrath and thousands of other fans enthusiastically greeted Smith, Coleman and series show-runner Steven Moffat during the panel before being treated to a sneak peek at the anniversary special that showcased both Smith's Doctor and Tennant's version, together at last. The trailer also teased that the Doctor will have to face some of the darker aspects of his past. “I’ve had many faces, many lives,” Smith’s Doctor says in voiceover. “I don’t admit to all of them. There is one life I’ve tried very hard to forget.” The special, set to air on BBC America on November 23, will be Smith's last outing in the role. Sadly for McGrath, Tennant did not make a physical appearance in Hall H, but the panel packed an emotional underscore none-the-less as fans said their goodbyes to Smith. "It changed everything: My life, my family's life," Smith told the crowd of his stint as the iconic character. "I'm proud and grateful to be part of it. ... Also, because I am on the way out, I just wanted to say 'Thank you, for all your support." In a fun video posted on YouTube, Smith even got to walk the convention floor. A feat few actors can achieve without being mobbed. His solution to avoiding fan chaos was to dress as Bart Simpson (see below). Moffat remained tight-lipped about his plans for the future of the role and which actor would next step out of the Tardis, though he admitted finding someone to encapsulate the broad history of the character would be difficult. “There’s only one Doctor. He has lots of different faces, but he’s always the same,” Moffat said. “He lives in the moment all the time. He never really looks back because if he did, he’d be staring all day. He’s a creature of the moment, right now. Tennant's absence aside, Lissa McGrath remains thrilled with the Doctor and his ever growing profile in America. "It's so much fun being a Brit in America and people understanding what 'Doctor Who' is," she said. "I can walk downtown in a Tardis costume and not look like I'm crazy."